Indian car designer Sudhakar Yadav has attempted to set a second Guinness record by building what he hopes will be the largest car in the world. The stationary vehicle - modelled on the 1922 Ford Tourer - is 26 feet (8m) tall and 50 feet long - nearly twice as high as a London double-decker bus. Mr Yadav already has a Guinness record for the world's tallest tricycle. 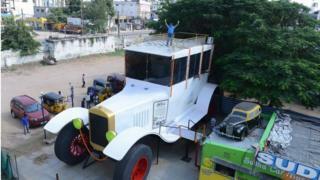 He owns a car museum in the southern city of Hyderabad where he displays a number of "whacky" car models. They come in all shapes and sizes and include a toilet commode, an aubergine, a billiards table and a lipstick. "We are aiming for the Guinness record of the world's largest art car. It's a new record and hopefully I will get it," Mr Yadav told AFP news agency. He said it could simulate the sound of a Formula One car and, like all of the museum's cars, had been made from scrap. His tricycle is even taller than the car - a staggering 41.5 feet.